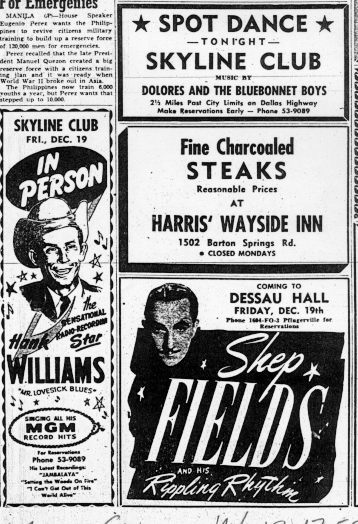 In December of 1952 Hank played at a gig at the Skyline Club; it was to be his last. On his way to his next gig in Canton, Ohio, Hank died while sleeping in the back of a car at the age of 29. Hank Williams saved his best for last, or almost last, and Austin was the beneficiary. Though he would play a pickup date or two during the final weeks of his life, his show at the Skyline Club on what was then the northern outskirts of town marked the end of the final tour of his 29-year-old life. The date was Dec. 19, 1952, and the place was packed. While he was still enjoying his reign as the best-selling country artist in America, his live performances had become increasingly chancy, due to Williams' dependence on alcohol, morphine shots, Dexedrine and painkilling pills, which provided the oblivion the spindly, sickly musician sought from spinal deterioration and marital wounds. Those few promoters who continued to book him -- including Austin's Warren Stark, who owned the Skyline and handled the rest of Williams' dates in East and Central Texas -- knew that there was only a 50 percent chance that he'd show. And if he showed, there was no predicting his condition. During the week of his Austin date, he'd already been booed off a stage in Houston and had canceled a show in Victoria. Earlier in the month, at a concert in Lafayette, La., he'd stumbled onto the stage, snarled, ``You all paid to see ol' Hank, didn't ya? Well, you've seen him,'' and stalked off without singing a note. So, there was no reason to anticipate that Williams would deliver one of the greatest and longest performances of his career at his final hurrah in Austin. Yet, according to Colin Escott's ``Hank Williams: The Biography,'' such a triumph is exactly what transpired. Backed by the Skyline house band and steel guitarist Jimmy Day (the sometime Austinite who would later play with everyone from George Jones to Don Walser), Williams pushed well past his typical 30-40 minute performance to close the joint past 1 a.m. with two full sets, singing everything he knew, the hits more than once or even twice. Whether or not he realized that his time was short, he poured everything into one long night in front of about 800 fans in a club in North Lamar. Twelve days later, he was dead, perhaps on New Year's Eve, discovered on New Year's Day, slumped and blue in the back seat of a white Cadillac on the way to a show in Canton, Ohio. Even by the punk-rock standards of a Kurt Cobain, Williams' life was a mess. But what a glorious mess of music he left behind, a legacy exhaustively documented through ``The Complete Hank Williams'' (Mercury), a 10-CD collection released to commemorate what would have been his 75th birthday today . Among the 225 cuts are 53 previously unissued, ranging from alternate takes of classics such as ``Lovesick Blues'' and ``Cold, Cold Heart'' to scratchy demos from the early '40s, when he was still mimicking the likes of Roy Acuff and Ernest Tubb while honing his songwriting chops, to tapes of his radio, television and concert performances to a spoken apology delivered before a concert that Williams was unable to make. Now remembered as the greatest of country songwriters, a populist poet, Williams enjoyed his own commercial breakthrough with 1949's ``Lovesick Blues,'' a show tune (by Irving Mills) from decades earlier that he was discouraged from recording. ``I'm So Lonesome I Could Cry,'' Williams' favorite among his own compositions, was relegated to the flip side of the novelty ``My Bucket's Got a Hole in It.'' ``Jambalaya'' was initially considered another novelty, the sort of commercial trifle with the shortest shelf life, though it remains one of Williams' most often-recorded classics. ``Your Cheatin' Heart,'' remembered as his signature tune, wasn't even released until almost a month after Williams' death. Much of Williams' most powerful material was inspired by his combustible relationship with ``Miss Audrey,'' to whom he was married and divorced twice, and who gave birth to Hank Jr. (actually Randall Hank, where Hank's given name was Hiram) during one of their off-again periods. By most accounts, she was even more impossible than he was, making Zelda and F. Scott Fitzgerald look like Ward and June Cleaver by comparison. She insisted on being part of the act, though her singing screech was only borderline listenable; she spent his money faster than he could make it; she hounded him at home and cheated on him when he was on the road, though Hank had his indiscretions as well. But listening to the songs that resulted -- ``Why Don't You Love Me,'' ``You Win Again,'' ``My Love for You (Has Turned to Hate),'' ``I Just Don't Like This Kind of Livin,''``You're Gonna Change (Or I'm Gonna Leave),'' as well as the aforementioned hits and countless others -- makes it plain that the artistic dividends more than justified the marital misery, at least where his artistic legacy is concerned. Such songs reinforced his bond with his fans, for, as Escott explains, ``he made his audience feel that ol' Hank was truly one of them, always in the 'dawghouse,' always one step ahead of the bill collector." ``What always impressed me was how young he was and how old he looked,'' said Sammy Allred, KVET-FM's morning curmudgeon and musical comedian with the Geezinslaws. ``And how skinny. I was at the Coliseum when Hank played here, two years after 'Lovesick Blues,' 'cause I remember he said, 'I've been living off this song for two years.' My cousin and I used to sneak in, carrying an empty guitar case and go walking in through the back door. We started talking to him, and Minnie Pearl was there, too. ``And he said, 'Boys, why don't we walk outside and talk so Miss Minnie can change clothes.' Rather than saying, 'You boys got to leave,' he walked outside with us and shot the bull and smoked a cigarette." Whenever musicians threatened to make his music a little too fancy or jazzy, Williams repeated a two-word admonition, ``Vanilla, boys.'' The improvisatory sophistication of a Bob Wills was not for him; he wanted his songs to retain the sturdy simplicity of the purest hymns or the most basic blues. Upon hearing a Hank Williams song for the first time, it sounded so familiar that you felt like you'd been hearing it forever. And the title was imprinted on your brain with every chorus.